early example of an "independent" publisher. Its initial strategy was to get a foothold on the newsstands by publishing new works by fan favorites, starting with Captain Victory, by Jack Kirby (Captain America, X-Men, among others). That's why, seeing the success DC Comics was having with The Warlord, and what a star it had made of its creator, Mike Grell, Pacific signed him to do another character of his own creation, this one for them. Grell had originally intended Starslayer for DC, back before Pacific started publishing — but before DC got it into print, and thus copyrighted and trademarked in their name, it fell victim to an event remembered by comics buffs as "The DC Implosion", in which company bean counters mandated a general reduction of the line. This led to the cancellation of The Secret Society of Super Villains, Black Lightning and other titles; and the abandonment of plans to launch several more, including The Deserter (a western), Vixen (a superhero) and this one. Since Grell retained ownership, he was free to offer it to Pacific four years later. In it, Grell had indulged his interests in both science fiction and Celtic-style heroic fantasy, by making his hero an ancient Celtic warrior, displaced in time and having adventures in outer space. 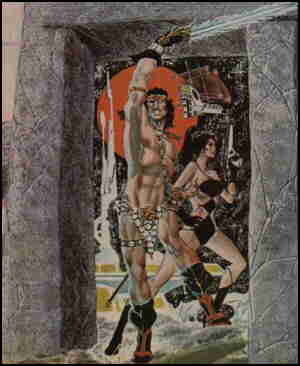 Pacific's Starslayer series (first issue dated February, 1982) was about Torin Mac Quillan, who was engaged in the perfectly understandable practice of resisting outside rule (in this case, by the Roman Empire), when, just before the moment of death in defense of his homeland, he was plucked up by a time-travel device and deposited in the distant future. It seems the inhabitants of the obsolete space ship Jolly Roger, who had done the plucking, had need of a man like him to oppose an evil regime that was ruling Earth. This was right up Torin's alley, so he he fought them to a successful conclusion by the end of the six-issue series. From beginning to end, despite the title, he didn't slay a single star. But eventually, he got his chance. Another start-up publisher, First Comics (E-Man, American Flagg) picked up the character and continued his adventures beyond that initial story. First's Starslayer #7 was dated August, 1983. For the next couple of years it was published on a reliable monthly basis. In this series, it became expedient, at one point, for Torin to destroy the Sun. The name of the Celtic death goddess, Morrigan, escaped his lips as he performed the deed, which brought Morrigan herself, by then a long-time resident of the land of defunct deities, back into active existence. Lucky break for Morrigan, who first offered Torin partnership in a massive intergalactic killing spree and then became his arch-enemy, but that was the only star Torin ever slew. By that time, Grell was no longer running the show. As of #9, John Ostrander (also responsible for Blaze of Glory, Marvel's team-up of western characters such as Kid Colt and The Rawhide Kid) and artist Lenin Delsol (Warp) took over while Grell went on to create Jon Sable, Freelance. Later creative personnel involved with Starslayer include Tim Truman (Airboy), Hilary Barta (Power Pack) and Tom Sutton (Vampirella). During Starslayer's run, several heroes were featured in its back pages before going on to independent existence. Back in the Pacific Comics days, both Groo the Wanderer and The Rocketeer were seen there; and at First, Grimjack debuted in the 10th issue. Grimjack and Torin even teamed up, unlikely as it seems, just before he moved out into his own title. Another unrelated hero had a different type of brush with Starslayer — that was to be the name of Jim Starlin's Dreadstar, until Grell asserted his ownership of the title. But the series fell into a long, slow decline — many say that was because of Grell's departure. It held on for more than two years, but ended with #34 (November, 1985). An attempt was made to revive it in 1995, when Acclaim (Magnus, Archer & Armstrong) published eight issues reprinting the Grell material, but that was its last gasp. Text ©2007-10 Donald D. Markstein. Art © Mike Grell.